Is the Sandler Sales Methodology for You? A number of proven sales strategies have been widely used throughout the business world. Some sales organizations use the simple five-step sales process, while others prefer the seven-step sales process. Still other organizations customize their own sales processes using aspects of a number of different philosophies. One of the most effective sales philosophies in existence, with 50 years of history behind it, is the Sandler Selling System, also known as the Sandler sales methodology. This counterintuitive approach, where sales representatives spend more time qualifying than closing, revolutionized the world of sales and continues to produce results to this day. The Sandler sales methodology, or Sandler Selling System, was developed in 1967 by David Sandler. Based in the psychology of human behavior, the Sandler sales methodology focuses on asking the right questions rather than simply providing answers. As a result, Sandler-trained sales reps come across as the opposite of the stereotypical pushy and aggressive salesperson. The Sandler methodology emphasizes a mutual level of commitment between the rep and the prospect, with the rep acting as a trusted adviser rather than a typical salesperson. 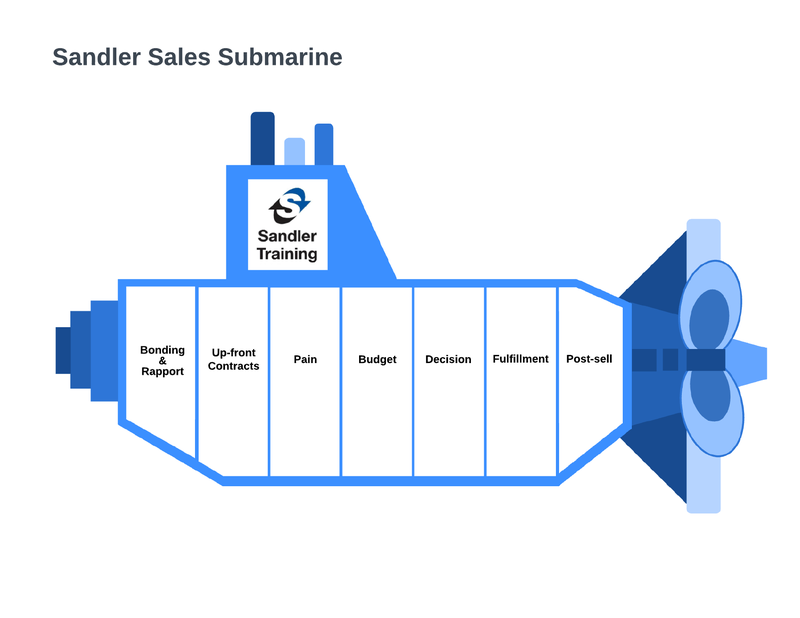 Download our Sandler Submarine template below (we made the submarine entirely out of shapes from Lucidchart! ), and follow along as we explain the steps of the Sandler sales process. Bonding and rapport: The salesperson develops a positive relationship with the prospect based on mutual trust. This rapport leads to more effective communication throughout the rest of the Sandler sales process. Up-front contracts: The salesperson, either formally or informally, outlines the steps of the rest of the process, including when and how the rep and prospect will further communicate and what will happen during each interaction. The core of the Sandler sales methodology is qualifying the prospect. While many other sales processes focus more on the closing stage, the Sandler sales process allows reps to build up mutual trust by asking questions to determine whether the solution being offered is actually the right fit for the client. Pain: The rep uncovers the surface problems the prospect faces, the underlying reasons for those surface problems, and the personal impact of those problems. The rep should ask plenty of questions, as the real problems they need to solve might not be the obvious ones. Budget: Rather than naming a price, the Sandler rep asks for some realistic financial guidelines from the prospect in order to craft a solution. The rep should also cover other potential budget concerns like time and personnel when applicable. Decision: The rep determines whether the prospect is qualified to make the decision about moving forward. If the prospect has decision-making power, the rep asks the right questions to understand the criteria they need to meet in order to make a final decision. Then, understanding all of those conditions, the salesperson asks if anything else could prevent the prospect from going forward. Armed with all of this information, the rep crafts the solution and leaves it up to the prospect to close the deal. Fulfillment: As a trusted adviser, the rep should still be asking questions to fulfill the prospect’s expectations. After making sure the decision-makers are all satisfied, it’s time to sign the contract and get started. Post-sell: After the contract is signed, sales reps should maintain a relationship with the prospect—now the client—in order to make sure the solution offered was the right one. If it is, the referral of a happy client can provide plenty of new prospects to begin the process again. Be sure to ask for referrals if the client doesn’t offer them up, as 91% of customers say they are willing to give referrals, but only 11% of sales reps take advantage of that good word of mouth. Now that you’ve learned about the Sandler sales methodology in depth, you can begin to put it to good use, and Lucidchart can help. By building flowcharts, templates, mind maps, and checklists, you can keep your sales process on track and manage a large number of prospects at once. Here are a couple of additional ways you can use Lucidchart, in addition to the Sandler Submarine template shown above. Brainstorm the right questions to ask to qualify prospects using our mind mapping tool. 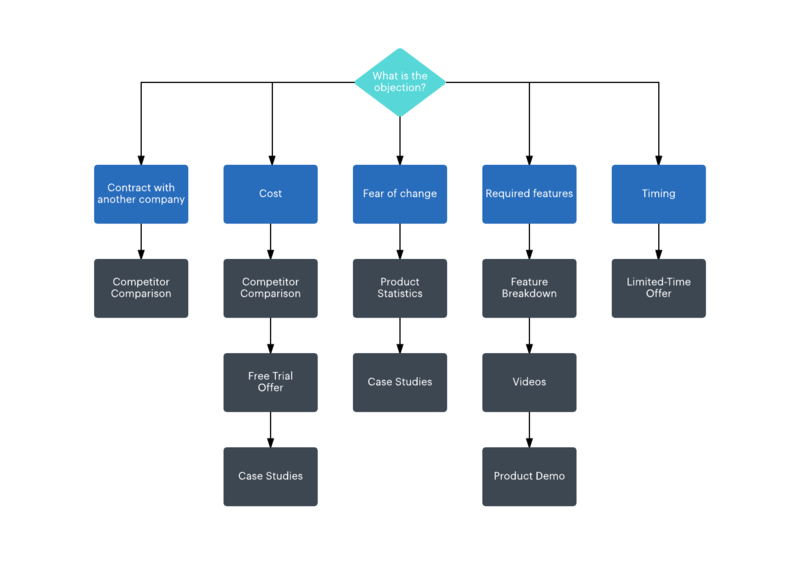 You can also create a flowchart with common objections you may face and the questions to ask to get the prospect back on track. Use Lucidchart to ensure that you and your potential customer remain on the same page as you qualify and then close. To better understand the prospect’s needs, you might want to create flowcharts or technical diagrams that confirm the current process they use. Then you can diagram your solution so they can clearly see the value. 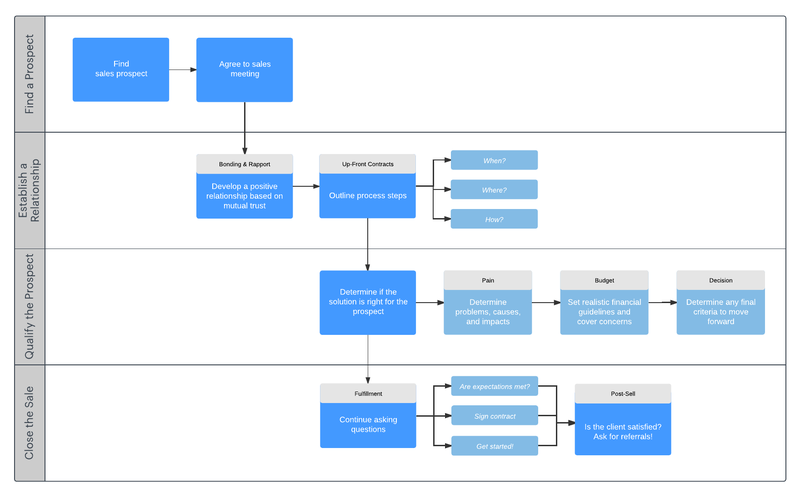 If you’re part of sales operations or sales leadership and you would like to apply Sandler Sales methodology throughout your org, you can customize a flowchart to show what your reps should do at each stage. Whether you adopt the Sandler sales methodology or not, Lucidchart can help you keep your client communications and sales processes organized. Sign up for free today to see all the ways Lucidchart can help your sales organization stay on track and close those sales.